It's easy to forget that the Isle of Arran lies considerably closer to the Kintyre peninsula than it does to the Ayrshire coast. Despite this, because Scotland's main centres of population lie to the east of the Firth of Clyde, there have always been many more people wanting to get to Arran from Ayrshire and Clydeside than from Argyll. As a result, even in the glory days of the Clyde steamers, Arran was always much better served by links to its east than to its west. 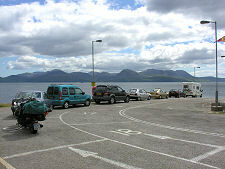 This continues today, with most visitors reaching the island via the ferry service linking Ardrossan in Ayrshire with Brodick on the east coast of Arran. 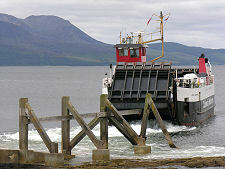 Much less well known is that the Isle of Arran also has a "back door", in the form of a vehicle ferry linking Lochranza near the northern tip of the island, with Claonaig, south of Tarbert on the Kintyre peninsula. 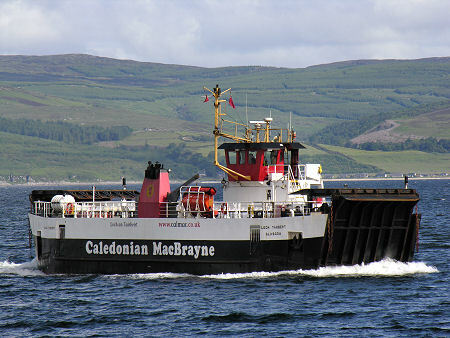 For current timetable and fare information visit CalMac's website. The presence of these two ferries means that Arran can be used as a stepping stone en route to or from Kintyre and Islay, allowing those wanting to start or end their holidays with a more relaxing alternative to the normal roads through Scotland's central belt. 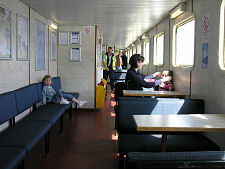 The ferry operator, Caledonian MacBrayne, offers a "Hopscotch" ticket that allows the two routes to be linked together. The vessel normally used on this 30 minute journey is the MV Loch Tarbert, built in 1992 specifically to serve on this route. 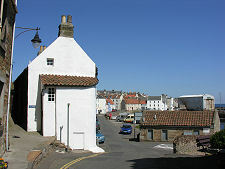 The Loch Tarbert was built by J.W.Miller & Sons Ltd in the beautiful fishing village of St Monans in the East Neuk of Fife. When the Loch Tarbert arrived on the route she provided a 50% increase in capacity over her predecessor, the MV Loch Ranza, also built for the route just five years previously, but rapidly overtaken by peak demand. Today you usually find the MV Loch Ranza on the other side of the Kintyre peninsula providing the service linking the Isle of Gigha to the mainland. 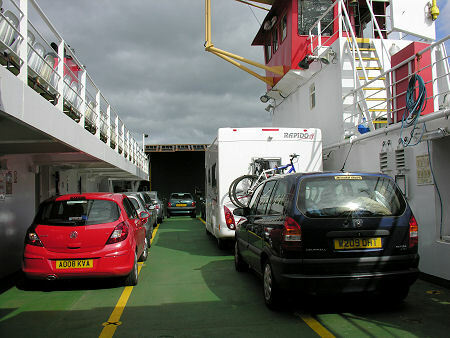 There has been a car ferry serving the route between Lochranza to Claonaig across the Kilbrannan Sound since 1972, when the aptly-named MV Kilbrannan first started sailings carrying a maximum of four cars at a time. 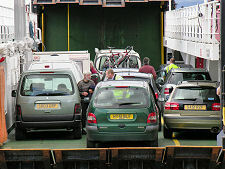 Other ferries, including the MV Loch Ranza, came and went until the arrival of the MV Loch Tarbert, and even today you may find other vessels providing the service when Loch Tarbert is in need of servicing. 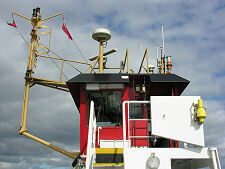 The images below left show MV Loch Riddon, normally based in Largs, standing in for MV Loch Tarbert at Lochranza in June 2008. 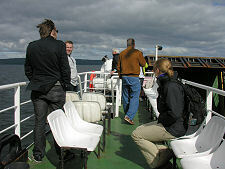 A couple of things are worth knowing about the way the Lochranza to Claonaig service operates. The first is that the ferry is not bookable. You turn up in time for the sailing you want and the vehicle queueing areas at both ends are marked out with 18 numbered boxes. 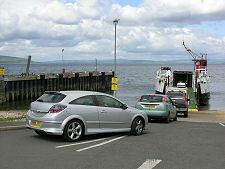 You simply park in the next available numbered box and from there proceed onto the ferry once it has arrived. 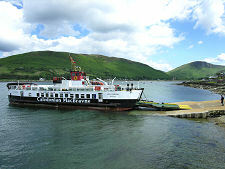 The second is that although it was operated on a seasonal basis for many years, since the late 1990s the service to and from Lochranza has been all year round. From late March to late October up to nine sailings operate daily (seven days per week) in each direction between Lochranza and Claonaig. During the winter this is replaced by a daily service, on which booking is both possible and advisable, between Lochranza and Tarbert, which offers considerably more shelter for both the ferry and intending passengers than Claonaig. 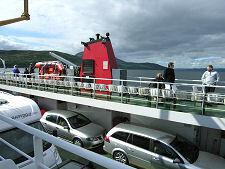 Full details, including current timetables and prices can be found on CalMac's website.